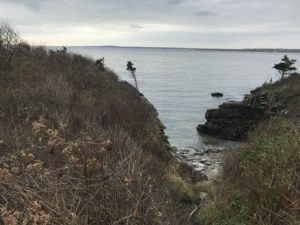 Beavertail is especially crisp in late november as the area’s lush summer vegetation has disappeared and given the area more of a hollow beauty. The trees have lost their leaves in preparation for the colder months ahead, all life enters into survival mode. These gray, black, and white little birds are preparing for the cold. As they have been chowing down on seeds and berries all summer and fall they are finally at maximum size, ready for winter. Their plumb bodies will help them to make it to spring, even when food becomes more scarce. Honeysuckle plants thrive in this area, easily growing and dominating out some of the more local plants. Although flowerless in the cold, they maintain power in numbers as the clear rulers. The deer population is booming at this time of the year, following the replenishment of many young new fawns over the spring and summer. 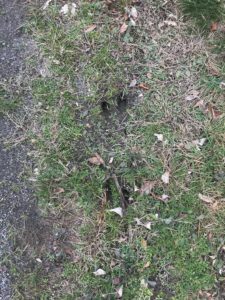 Sighted deer tracks indicate they are on the move, likely eating what vegetation they can find in preparation for future food scarcity. Paper Birch trees line parts of the trail, exemplifying their ability to grown in damaged forest areas. They stand tall and beautiful inciating to me that the trails creation is fairly young, less than 40 years. 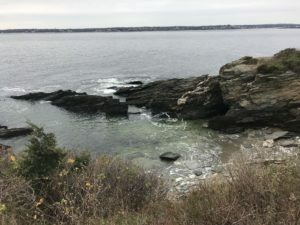 This week’s guest phenology site was beautiful Beavertail State Park in Jamestown Rhode Island. The small peninsula stands tall lined with menacing shale bluffs. Hidden between the guarding rocks are small sandy coves waiting to be explored. I notice how the water lapses and swirls creating small tide pools upon protruding shale. Similar to the stream side erosion at my site in Centennial Woods, the shale bluffs appears to be chipping away on a much larger scale with the constant crashing waves. Another similarity I notice between the two sites are the skeletons of seasonal shrubs and trees. 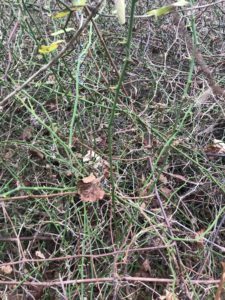 Here at Beavertail honeysuckle is far more dominant, intertwined with thickly growing pricker bushes. Rather, at Centennial, the areas understory is more bare. A noticeable amount of Paper Birch trees line the trail, mixed with an assortment of native New England trees at both sites. 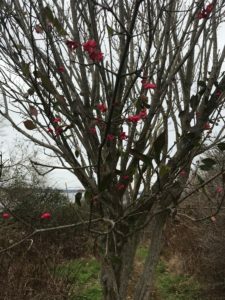 Mysteriously mixed in at Beavertail is an unusual tree with small pink flowers still in bloom, standing alone. 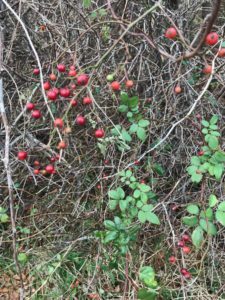 Shrubs full of red and blue berries also line the trails here in Beavertail, proving to host more invasive species. A Chickadee can be heard sweetly chirping in the distance and left in the dark brown mud are the tracks of a deep. Both of these indications of life are something not yet observed in Centennial. Lastly, a small mushroom sits in the grass, slowly eating away at autumns fallen leaves. It has a golden-brown, marshmallow complexion with the addition of small white speckles. This mushroom reminds me of the ones spotted on my last phenology site visit in Vermont.